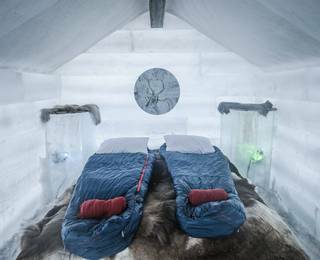 Enjoy a complimentary night in an Ice Cabin on all February and March departures. Quote 'ICE CABIN' when you book. Terms and conditions apply, click here for more information. 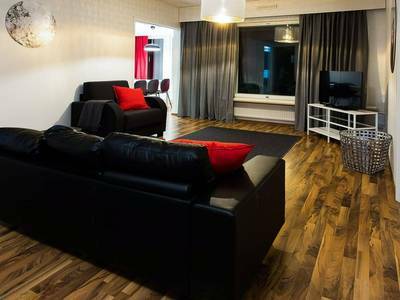 The Apukka Resort is just a short journey from the airport and downtown Rovaniemi so you can start enjoying your holiday straight away. All the activities start pretty much from your doorstep, so you’ll waste no time at all getting stuck in here. You’re away from light pollution even though you have easy access to the city and, the knowledgeable guides give you every opportunity possible to see the incredible Northern Lights. As ever though, the lights are really just the cherry on top of what is an already amazing holiday packed full of once-in-a-lifetime activities. 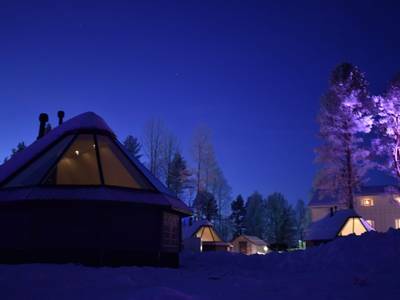 Just 15-minutes from Rovaniemi, Finland but far from the city lights, the Apukka Resort offers a true Arctic adventure filled with bucket list experiences. 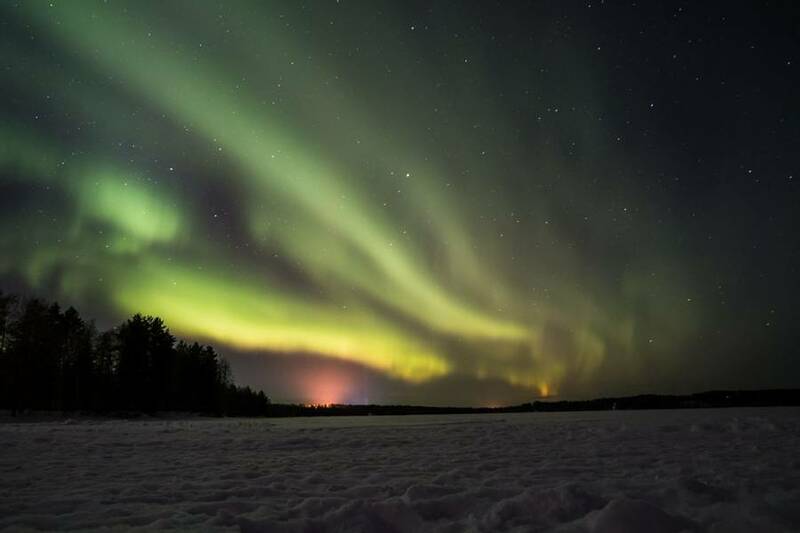 Over 3 nights, you’ll search for the Aurora in unforgettable ways, such as a ride on the innovative Snowtrain. 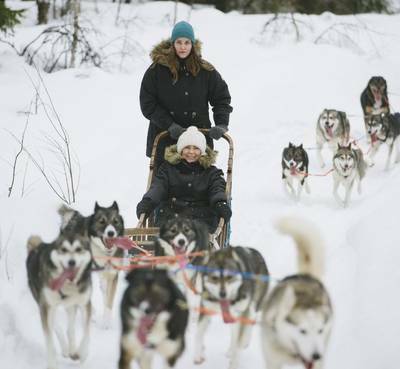 Dog sledding is also included to complete your stay! The Apukka resort is just a short ride from the airport but takes you into its own piece of wilderness for a getaway like no other. 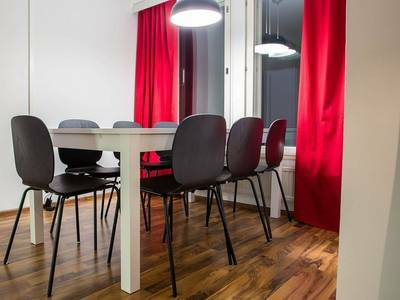 We’re thrilled to offer our guests three nights in the Apukka Apartments or Apukka Holiday Home. You may well be able to see the Northern Lights from the frozen lake on site. However, to enhance your chances of a sighting, we have included some fun Aurora safaris. From a relaxing ride on the Snowtrain to an authentic experience on a reindeer-pulled sleigh, we offer even more options to get you on the hunt for the green dancing lights above. 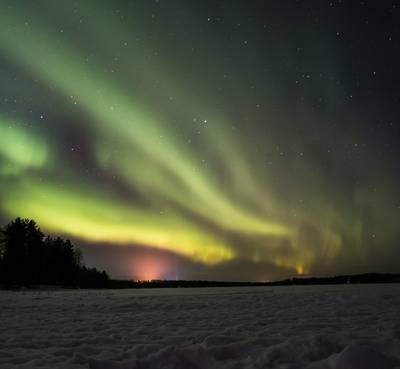 Our local guides will use their expert knowledge of the Northern Lights and the area to maximise your chances of seeing this astonishing natural wonder. Throughout your stay here, you’ll also enjoy some true Arctic adventures during the day. 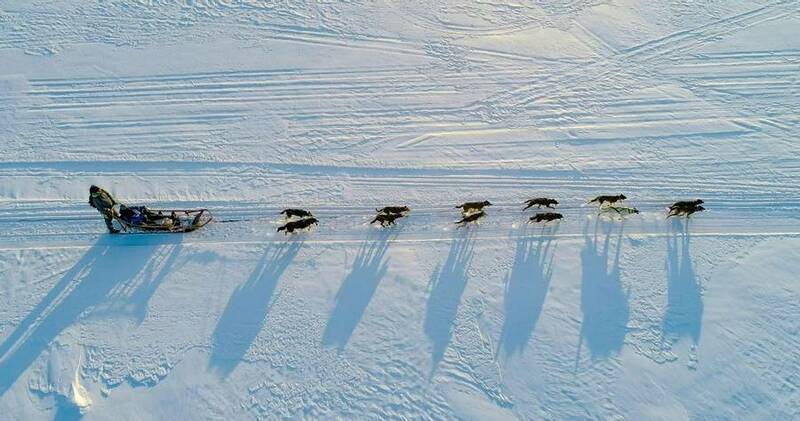 Take the reins as you try your hand as a musher, being pulled by a team of eager sled-dogs across the brilliantly-white Arctic. You can also explore the winter white environment via a variety of innovative snow-based activities you could never try at home. 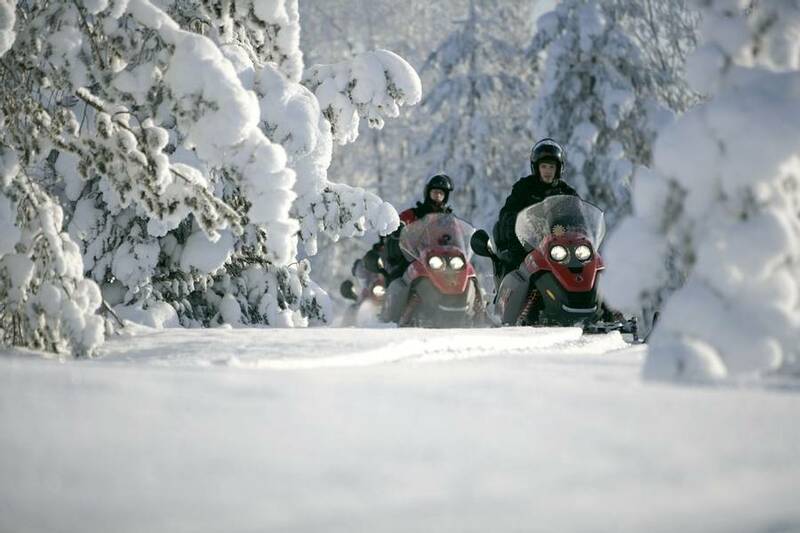 Whether you want to unleash your adventurous side on a snowmobile or you want to explore the scenic landscape by snowshoe or ski, we have the activity to suit you. Please note, most activities start just a short walk away from your accommodation. You will need to cross a road, but a guide will be with you at all times to help you cross. Vehicles do pass along this main road, however, it is not a busy route. 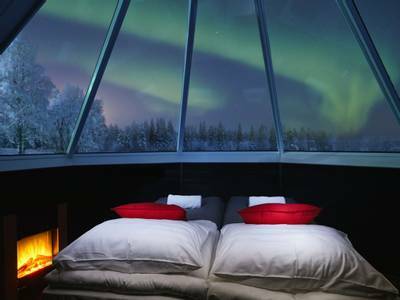 The Apukka Resort is ideally situated so you can enjoy the wintery wilderness of Lapland whilst also basing yourself in prime Aurora territory, all with easy access to the city and airport. 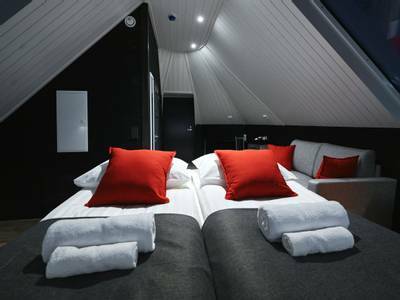 What’s more, as a centre for ice building we give you the opportunity to make the most of your stay here with a complimentary night in an Ice Cabin. With so many things to discover from the Apukka Resort, this is a captivating Finnish escape. On arrival at Rovaniemi, our transfer vehicle will be waiting to take you on the 15-minute drive to Apukka. It’s a short journey but one that gets you into Apukka’s wilderness and in Aurora hunting territory. You’ll check into your accommodation before enjoying a 3-course dinner buffet in the restaurant. You’ll also be given your warm winter clothes to use for the duration of your trip. Depending on your flight times, you may want to start searching for the Northern Lights as soon as you arrive. 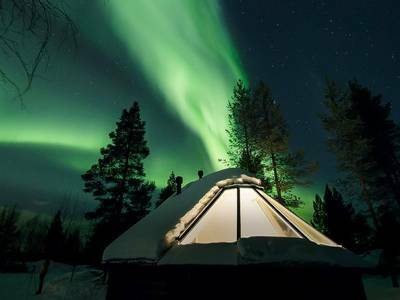 See our ‘Personalise’ tab for a range of Aurora hunting activities. 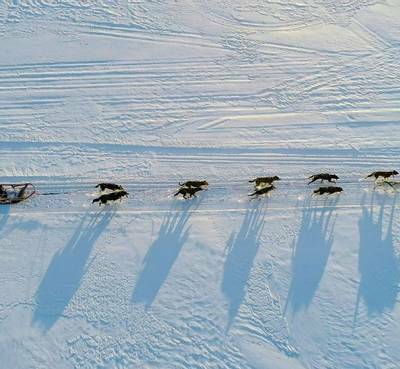 After breakfast, you’ll get to test your skills as a musher as your new canine chums pull the sled along a 7-10km trail across frozen lakes and through the snowy forests. The tour lasts approximately two hours with one hour on the sled and plenty of time to pet and take photos with the dogs. After dinner, you’ll head out into the night for a unique way to try and see the Northern Lights – in a cosy Snowtrain carriage pulled along by our guide’s snowmobile. You’ll head into the dark, still and silent wilderness until you reach camp. 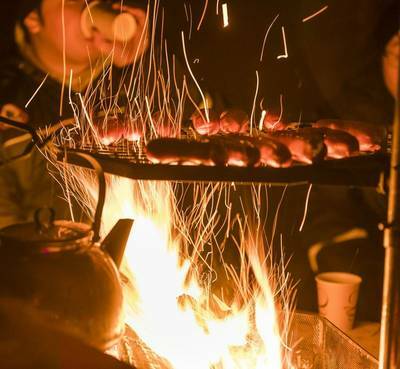 Camp is a traditional Lappish “Kota”, essentially a wilderness hut with a blazing fire, ideal for cooking sausages and preparing warm drinks. It also provides the opportunity for your Aurora expert to help you with your camera settings in preparation for what will hopefully be an amazing celestial light show. The Snowtrain tour lasts approximately three hours. Fill up on breakfast then it’s up to you how you want to spend the daylight hours before the Aurora hunting begins again. The ‘Personalise’ tab will help you choose an experience which will really make the most of your time here. 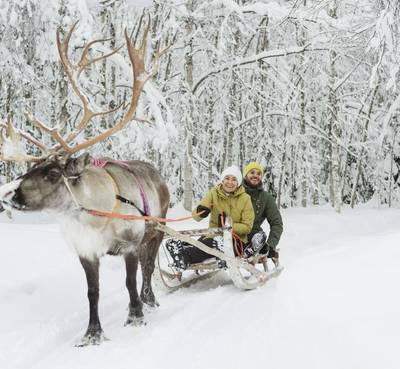 As night falls, it’s time to travel in traditional Lappish style in a reindeer-pulled sleigh. Enjoy the nature around you as you’re taken through a snowy forest to reach a charming hut in the heart of the wilderness. Here, the reindeer will rest as you warm up with hot drinks and snacks. With a bit of luck, you may see the Aurora on your night safari too. After breakfast, it’s time for your Finnish wonderland escape to come to an end as we transfer you to the airport and you take your memories home. If you have an early flight time, we’ll box up breakfast to take with you. 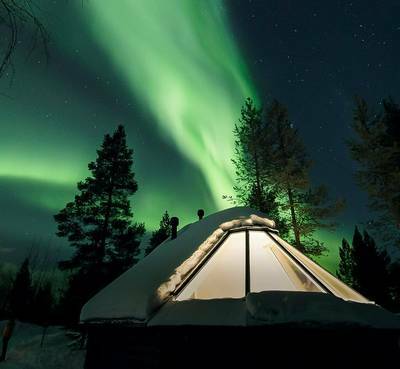 Close to Lapland’s capital Rovaniemi but in its own wilderness setting, the Apukka Aurora Borealis Resort is your comfortable haven in the Arctic. 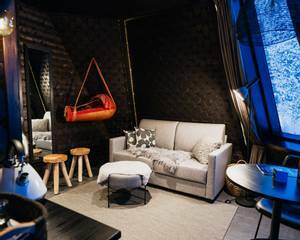 With Scandi-style décor, the resort offers modern and stylish Apartments and Holidays Homes as well as the chance to have a special night in an Aurora Cabin and Ice Cabin. 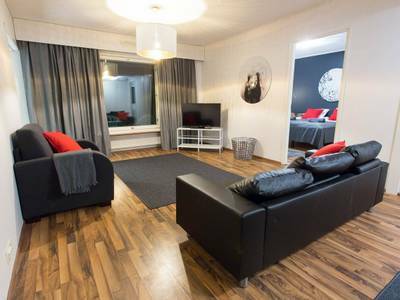 After a day out in the winter wonderland, these relaxing apartments are the perfect place to shake the snow off your shoes and unwind. There is a bedroom with twin beds and a fold out sofabed for one person. These comfortable holiday homes are a great option for those who want to make their stay feel a bit more like home. 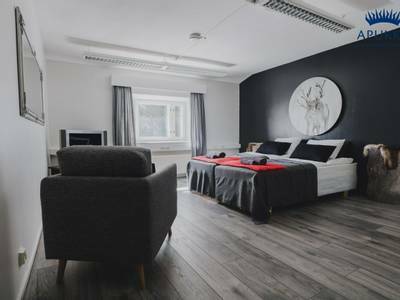 You have your own private entrance into your welcoming accommodation which is equipped with flat-screen TV and WiFi so you can relax after your adventures out in the Arctic. 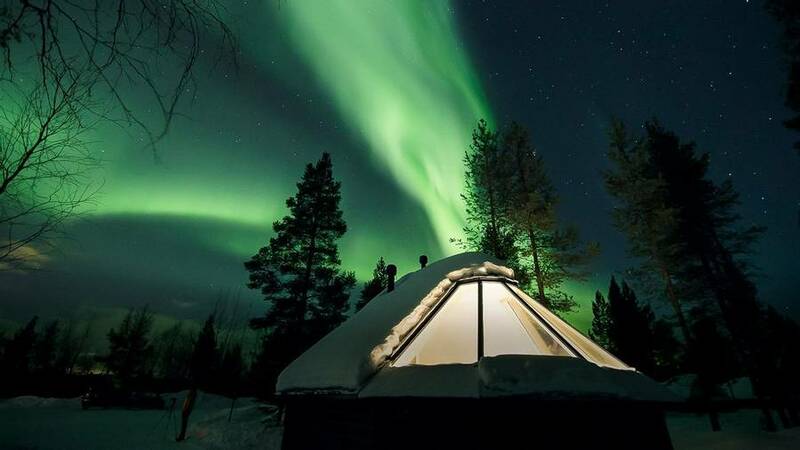 Situated just a short drive from Rovaniemi but set in wilderness surroundings away from light pollution, the Apukka Resort is an ideal location for both Arctic and Aurora adventures. 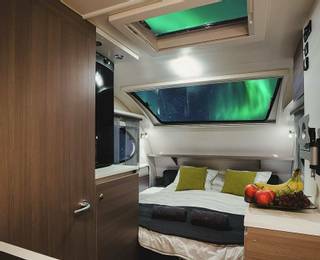 Immerse yourself in the natural surroundings when you stay in an Aurora 360 Cabin. The design is based on a ‘Komsio’ which means a traditional Sámi cradle, and this boutique hut certainly makes you feel comfortable and cosy. 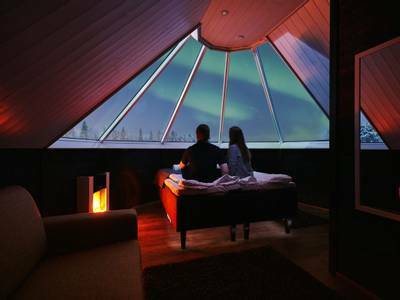 The accommodation covers two levels, with the top tier being of particular interest for Northern Lights enthusiasts. 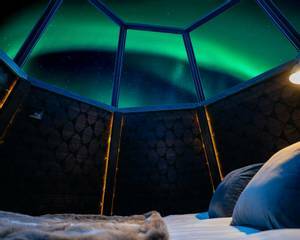 Here, you can lay in bed with a 360o view of the Arctic sky, and if conditions are favourable, you’ll see the Aurora Borealis above as you stay tucked up. 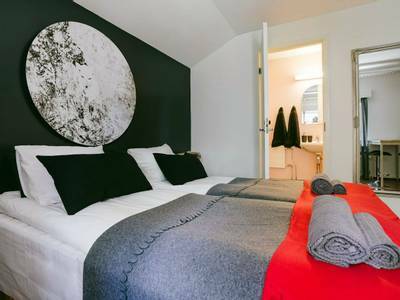 SLEEPS 2 + 2 PERSONS: This self-contained accommodation comes equipped with a private bathroom with shower and toilet, and an electric fireplace – perfect after a day exploring the snowy surroundings. 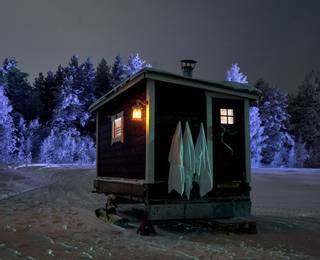 Really put the icing on your winter escape with a night in an Ice Cabin. 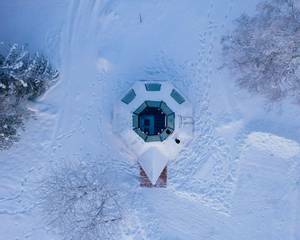 It’s hard to believe you’ll have a cosy night in a building made of 100% pure ice but, with thermal sleeping bags and a structural design that keeps the interior between 0 and -5 degrees no matter what the temperature is outside, you’ll be nice and warm in this incredible cabin. Apukka is a centre for ice building, so make the most of your stay here and enjoy a truly unforgettable night. Book this trip before 1st December 2018 and receive a free night in an Ice Cabin. Quote 'ICE CABIN' when you book. Terms and conditions apply, click here for more information. Take your escape in the Arctic wilderness even further as we drive you and your Aurora Wagon to a private spot of your choice for the night. Choose from the huge area of natural wilderness to get even better views of the night sky. 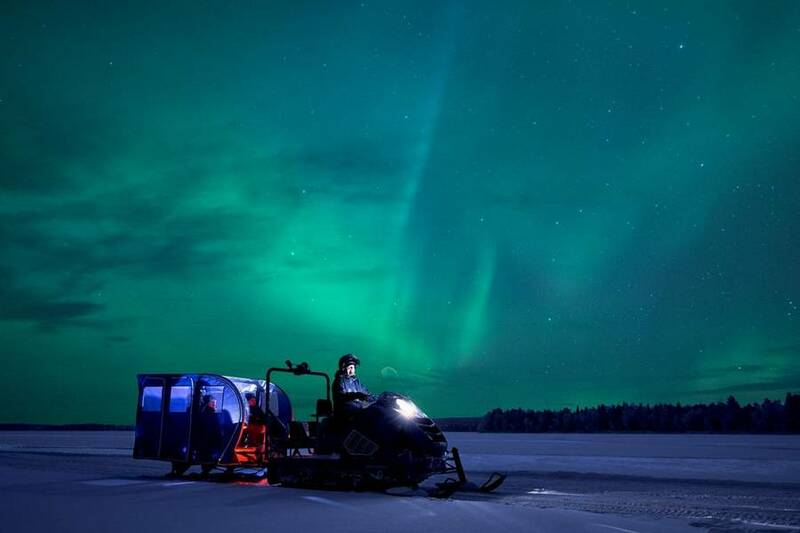 You can even park on the frozen lake for uninterrupted 360° views of the Arctic sky. 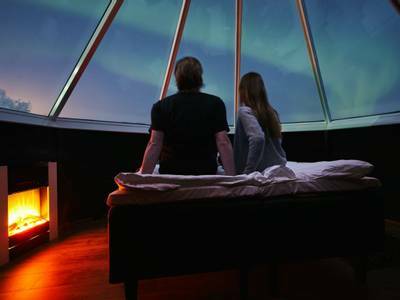 All cabins are equipped with panorama window to give you the best chance of seeing the Northern Lights. Saunas are a Finnish tradition and what better way to soak up the culture than in your very own sauna wagon? Get a relaxing experience delivered straight to your door or enjoy some downtime in the middle of the wilderness – these mobile saunas can be placed anywhere! 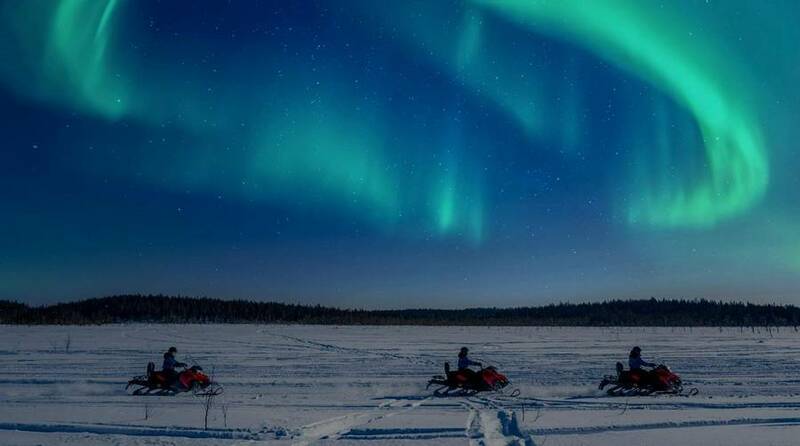 Go on an adventure to find the Northern Lights during this Aurora snowmobile safari. 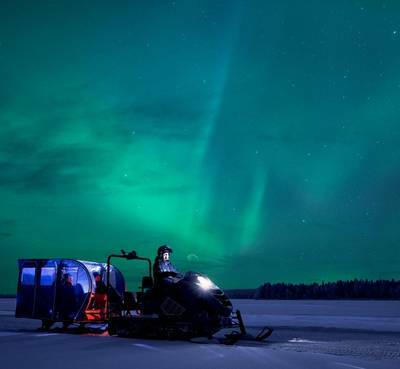 A snowmobile allows you to get to locations that would be hard to reach by foot and can help you outrun any cloud cover that may be standing in your way of seeing the Aurora. 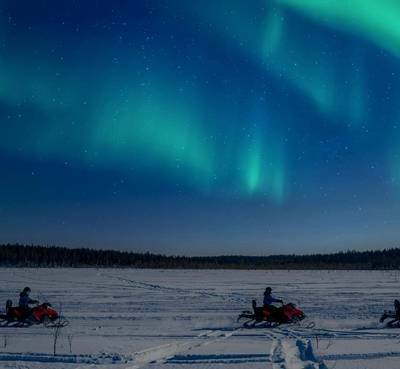 You’ll ride out to a suitable location, will have a hot drink and sausages by an open fire and you’ll learn more about nature’s amazing light show and with any luck, see them for yourself. 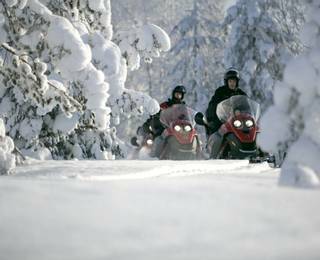 A full safety briefing will be given before the trip and you must be over 18 years old and hold a full driving licence to drive a snowmobile (price based on 2 sharing), however, children can take part as they ride in a sledge pulled by the guide. Dog sledding has long been a favourite amongst our guests but this trip has an extra special touch. You’ll take the incredible Snowtrain to the husky farm, sitting in your warm carriage as you journey through the snow-capped forest before meeting the team of dogs. Your pack of excited dogs will then pull you along a 7-10km trail to give you an insight into life as a musher. This trip combines one of the most popular activities in the Arctic with a night of Aurora hunting. 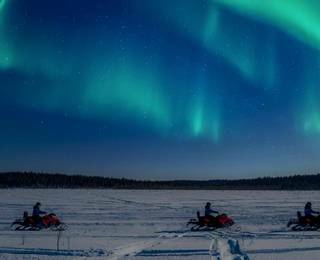 You’ll take it in turns to be a musher (price is based on 2 sharing a sledge), as your pack of sled dogs guide you through the wilderness on the lookout for the Northern Lights. 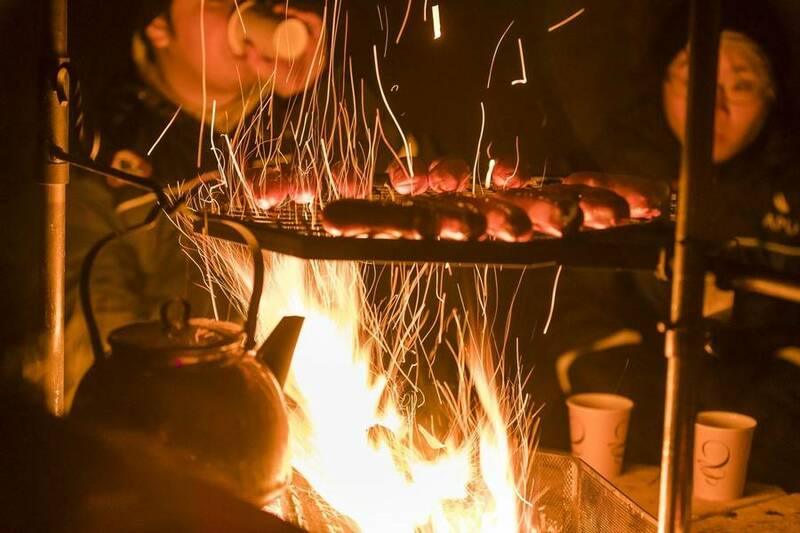 There will be a stop off at a traditional Lappish hut where an open fire, grilled sausages and hot juice will keep you warm as you search the sky for the Aurora. 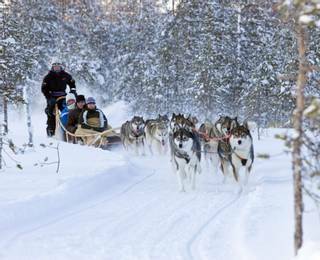 INCLUDED: Winter clothing, car transfers, hot drink, sausage, guiding, husky petting, 7-10km husky ride. Just because there’s snow on the ground doesn’t mean you can’t enjoy mountain biking through amazing scenery. 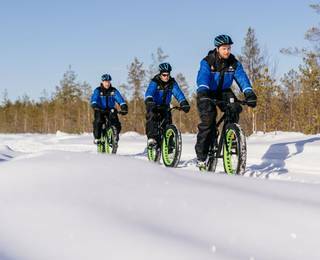 Fat bikes come equipped with huge, wide tires (hence the name) and can handle the wintery conditions of the area. This is a unique way to explore your surroundings, stopping along the way to warm up with a hot drink. Combine two magical experiences for an amazing way to explore your surroundings. 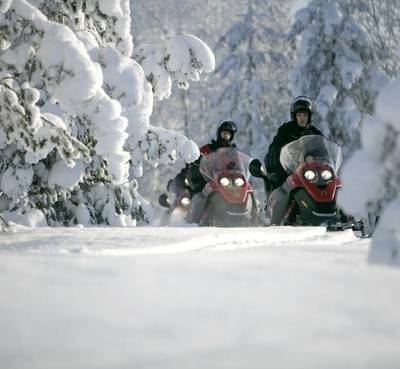 Take the unique Snowtrain through enchanting Arctic woods where you’ll be cosy in your carriage pulled by our guide’s snowmobile. 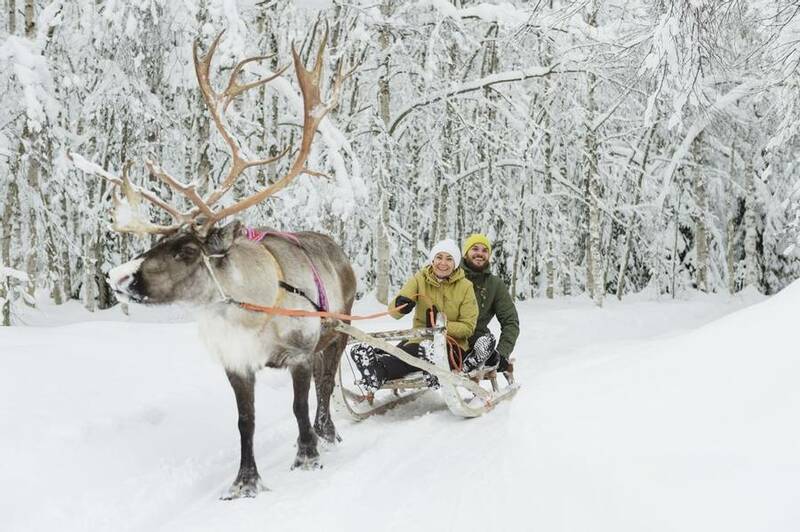 You’ll then reach a local reindeer farm for a short sleigh ride before meeting the herders who will tell you about their lives while you warm up with hot drinks and a bun. Skiing has been a form of transport for thousands of years and is a firm local tradition. 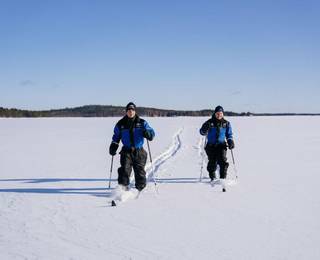 You’ll be right in the heart of the snowy surroundings as your guide takes you cross-country skiing through captivating Arctic forests. You’ll also stop to enjoy a hot drink en route. No prior experience is required as you will be given full tuition. Snowshoes allow you to walk on thick snow without sinking so you can access amazing landscapes that would be hard to reach by foot. Going at a slow pace, you’ll enjoy the nature of the Arctic Circle around you, breathing in its fresh air with only the sounds of the crunchy powder below you. You’ll also stop to enjoy a hot drink to warm you up. There’s nothing a Finn enjoys more than a relaxing sauna. 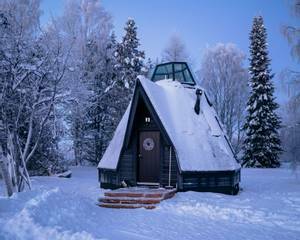 This Arctic Sauna Experience will show you what the fuss is all about. Making use of the sauna complex on site and with the guidance of a host, you’ll have the opportunity to try three different types of sauna. After a day exploring the Arctic, there is no better place to unwind than in a traditional sauna. 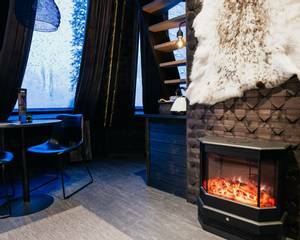 At Apukka, you can relax in the large electric heated sauna as well as in the outside small wooden heated saunas. However, your holiday is all about trying new experiences and with the Ice Sauna, you’ll be hard pushed to find a more unlikely experience. Though the concept seems impossible, you can actually enjoy the steam from the hot stove as you’re surrounded by thick ice walls! To really get into the Finnish spirit, why not try rolling in the deep snow between your sauna sessions? It may sound bizarre, but it is actually a wellness technique used frequently in these parts. A word of warning, however. Snow holds the temperature of the air so, if it’s -15C, that snow roll will be invigorating to say the least! For a morning to remember, take your snowmobile to places you’d never be able to reach by foot with the pinnacle being a beautiful lookout spot in time for sunrise. 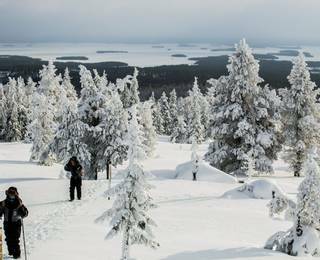 Whether you’re travelling in mid-winter and catch the gentle tones of ‘kaamos’ the time when the sun never fully rises above the horizon or visiting in the springtime to see the Arctic Circle sunrise, you’ll enjoy the amazing views and unparalleled silence this landscape offers. The hotel staff and guides were very helpful and friendly, and very Finnish! Read more understanding of each of her animals giving us total confidence. Then her voice as she called out ‘Aurora’ and there it was. Use stunning. The next day the genuine delight of Hannah? as she asked if I’d seen it and her true pleasure for me. Such lovely caring staff. I HAVE told everyone! The staff are truly committed to doing everything to make sure our stay was enjoyable. They were living the magic with us and were as thrilled as we were with our Aurora sighting and our pleasure in the activities. We were delighted to find a bottle of fizz in our cabin as a birthday celebration. So kind. Read more a perfect combination! 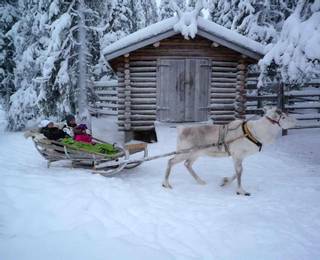 The reindeer sleigh at night was magical - snug in our blanket enjoying the peace of the forest. It's difficult to chose between them, they were all very special. Exceeded all our expectations. Saw the lights although they weren’t very bright but that was icing on the cake. It was our first winter holiday and we loved every minute of it and will definitely do one again. I can't express how perfect the whole experience was. Everything, down to the last detail, was considered.